I love date nights. Looooove them. However, we have 5 kids, recently moved to a new area, and don’t live near any of our family. We totally strike out in the babysitter department. That shouldn’t stop us from having a good time and spending some quality time together though, right? Didn’t think so. For a long time we had one or two shows we watched together each week. Then we chose to get rid of our satellite tv services, so we switched to renting or buying a movie once or twice a month. Life got crazy, and that got pushed to the back burner. This year, we’re revamping our date nights in with a Date Night Challenge. If you missed my last post, or want to join in, go check out the intro post. This article contains affiliate links. Purchasing through these links will not change your pricing, but I will receive a small percentage. Me: Yaaaay! These are so fun! Back to my childhood! I’ve been wanting one of these for years. Steven: (peeking in the box) You’re such a kid. My husband’s initial reaction may be a tad bit true. I’ve never denied it though. The Spirograph set has mostly stayed the same over the years. However, some special edition kits have been added, such as the Spirograph Cyclex. The appeal of the Spirograph was the open it and go aspect. I wanted something quick and fairly easy to master. As I mentioned before, I’m not very gifted in the drawing area. Who wants to be discouraged on a date night? Not me. I was thankful for the nifty design guide included in the set. The guide gives pictures and instructions on how to create many different designs – from extremely simple to rather complex. Looking for more Spirograph fun? Check out my Spirograph ideas board on Pinterest! So what fun activities did you come up with for a January date night? Share them in the comments or over on Instagram. 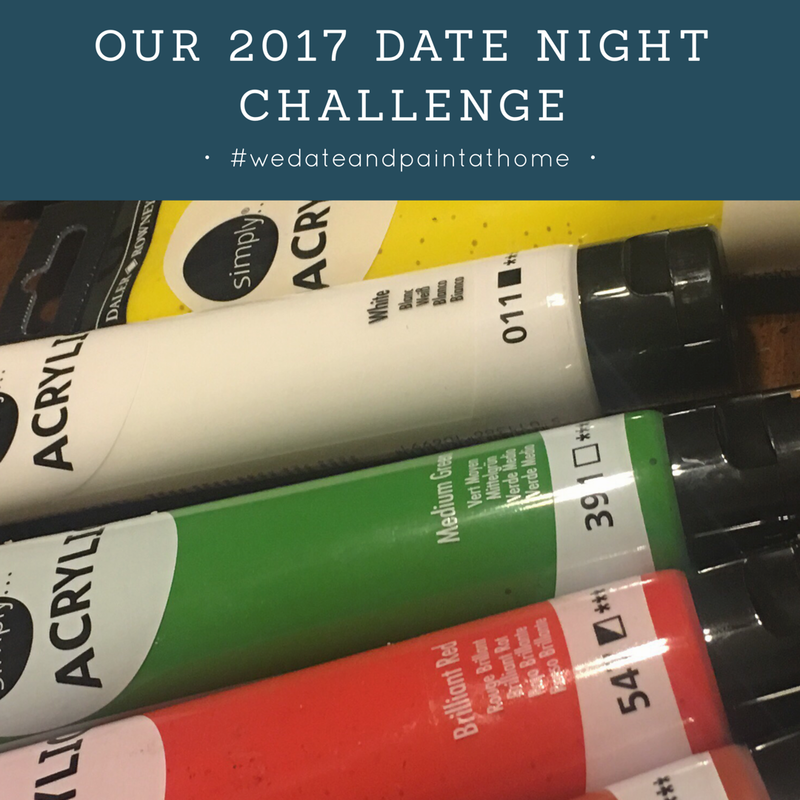 Don’t forget to tag me (@mommythezookeeper) and use #wedateandpaintathome! I can’t wait to see what fun y’all had! If you’ve been following me on Instagram, you should know by now I’m pretty excited about my new bathroom! Just a bit. It’s still not 100% complete, but it’s amazing nonetheless. 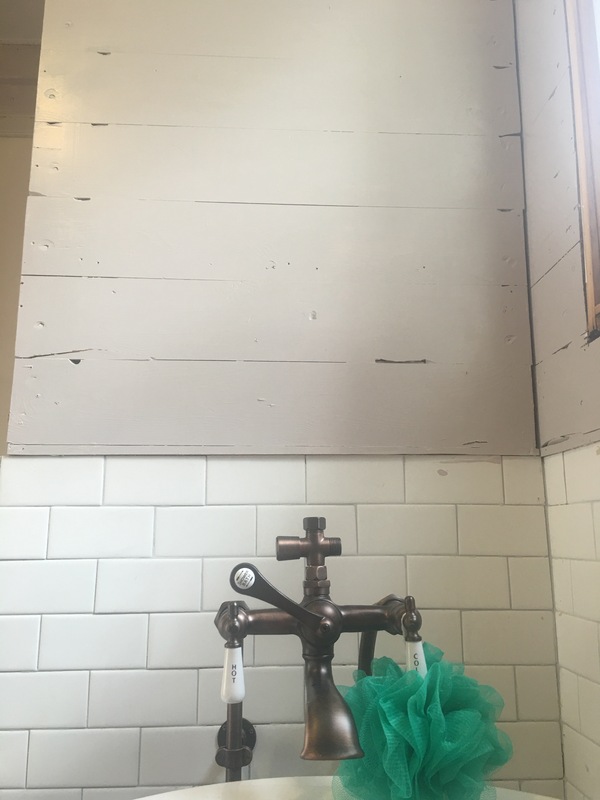 Let’s take a moment to appreciate that subway tile and original shiplap. When I walked in there last night, it smelled like a litter box. Y’all, our cat has not been inside in a few days. It could not be blamed on him. I’d also like to note that the smell was NOT present just a few hours earlier in the evening. It appeared sometime between the time I fed my children and the time they went to bed! I was somewhat shocked by the revolting smell and that it appeared so quickly, but I guess I shouldn’t have been. Two little people that often forget we have modern plumbing (ya know, a flushing toilet), a little one potty training, and one in diapers, and it’s our laundry room, so dirty laundry too… Yeah, it’s a daily battle. 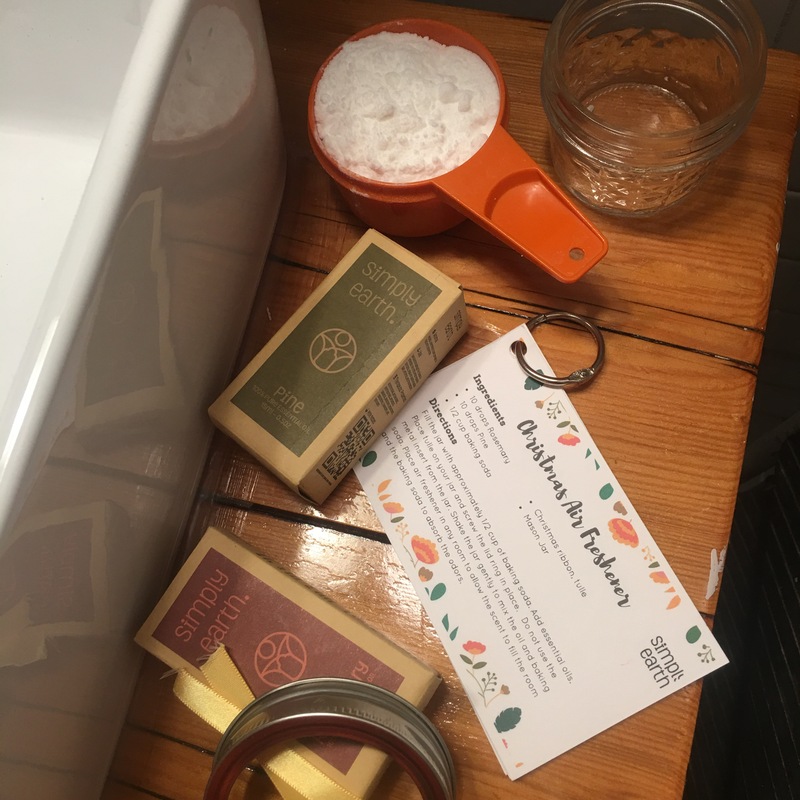 And good thing Simply Earth sent me one of their subscription boxes to review! 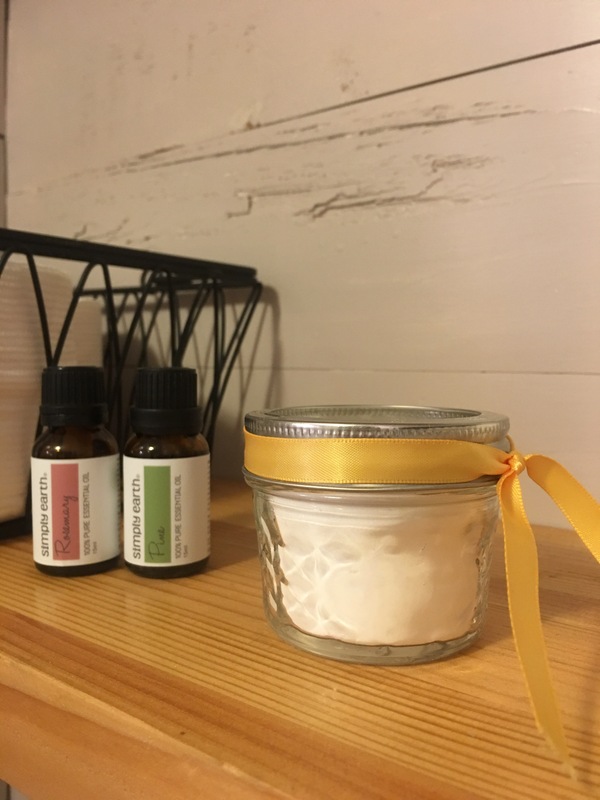 I pulled everything out and whipped up this easy and lovely air freshener in less than 5 minutes! The box included everything I needed except the baking soda. Now my bathroom smells like Christmas! What is Simply Earth, you ask? It is a subscription box service with each box containing 6 or 7 different recipes with a new theme each month such as holiday (This one was Christmas! ), bath & beauty, or DIY cleaning. 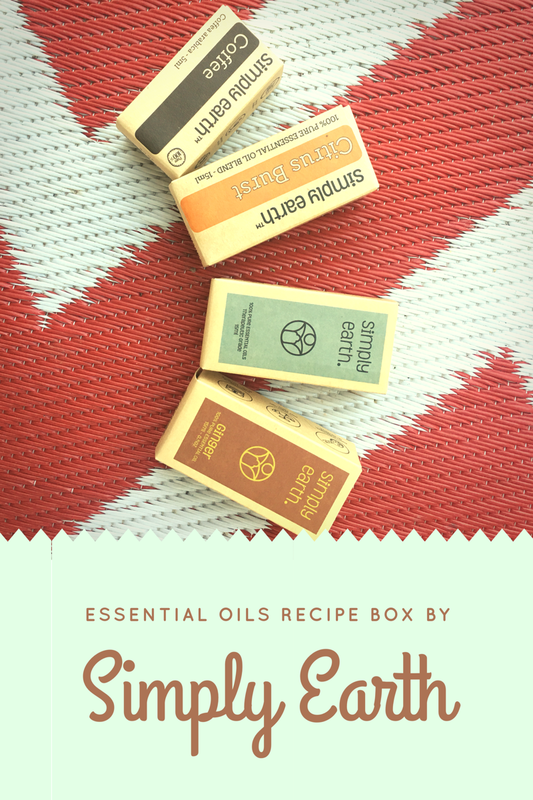 Each box also contains 5 FULL SIZE bottles of essential oils (100% pure essential oils), and extras such as labels and containers to make your recipes. I was so very impressed from the moment I opened my first box. 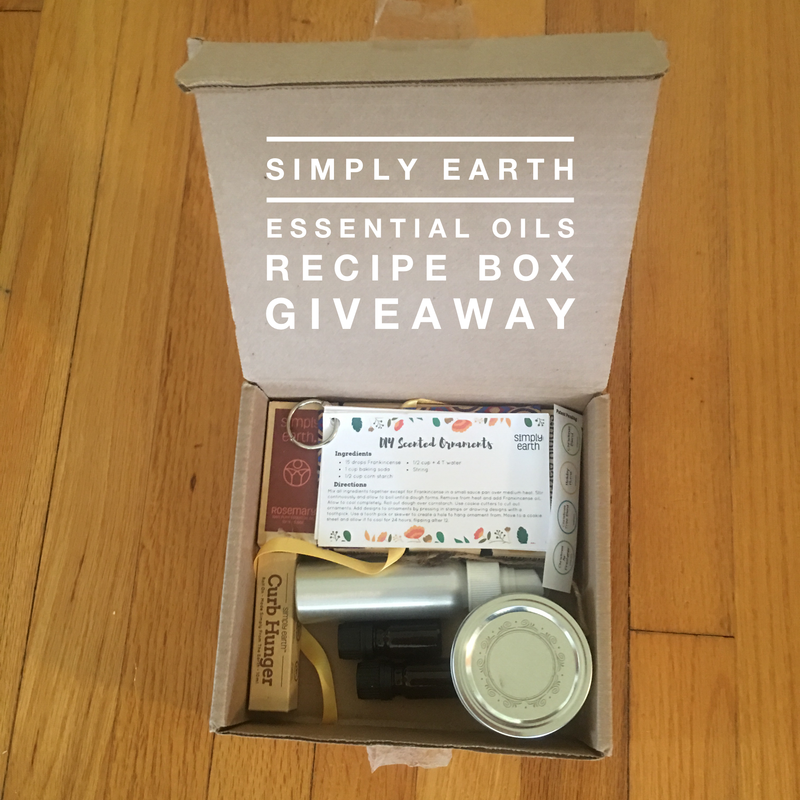 I haven’t even done all the recipes/crafts yet from my first box (I’ll share more as I do), but I wanted to share this one with you and tell you how you can win your own Simply Earth box! Just click the link below to enter, and a winner will be chosen next week! Yep, it’s that simple. Too impatient and want to order your own subscription right away? Head on over to SimplyEarth.com and use the code: ZOOFREEDIF to receive a free diffuser with your order! Be sure you have the subscription box and diffuser in your cart to use the code! Be sure to check out Simply Earth on Facebook, Instagram, and Pinterest too for more info and fun! Ripley’s Guinness World Records Museum was another fun stop on our recent vacation to Gatlinburg, TN. This museum may be small, but my husband and boys agreed it was one of their favorite activities of the week. We received complimentary tickets to this attraction in exchange for an honest review. All thoughts are my own. Located just a couple of doors down the street from Ripley’s Marvelous Mirror Maze, the Ripley’s Guinness World Records Museum is full of fun exhibits telling about amazing world records and cool facts. For instance, did you know that the Tulip poplar is the largest tree in the Smoky Mountains? Some of about 8 ft. in diameter can be found near the Ramsey Cascades! We also learned about the world’s largest rubber band ball, the largest bubblegum bubble blown, the most backward free throws in one minute, and a ton more. The entry level was a pretty quick walk through, and we were a bit unprepared for the flight of stairs with our big double stroller. However, with myself and my husband, it wasn’t a huge problem. For others with little ones, I’d recommend leaving the stroller in the car and using a sling or carrier. The bottom level of the museum was well worth that small bit of effort though! The part we really loved at Ripley’s Guinness World Records Museum? The bottom floor of the museum is filled with over 20 interactive games and challenges that allow you to test your own skills at some fun world record activities! No, the results aren’t actually recognized by Guinness World Records, but we sure had a blast trying. The kids also did some speed boxing, started their own rubber band balls, and a whole lot more. Needless to say, we had some happy and exhausted kiddos when we left. The Ripley’s Guinness World Records Museum provided an afternoon of family-friendly fun. Sunday – Thursday: 10 a.m. to 11 p.m.
Friday & Saturday: 10 a.m. to 12 a.m.
My husband and I wanted to window shop and visit some of the different stores in Downtown Gatlinburg, but we knew to do that with our kids, it would be best to break it up a bit with fun activities for them. The first activity we chose was Ripley’s Marvelous Mirror Maze. We did receive complimentary admission to this attraction in exchange for a review, but all opinions are mine. Overall, I wasn’t super impressed, but I wasn’t terribly disappointed either. Ripley’s Marvelous Mirror Maze is a small attraction, but my kids had fun, and that was the whole reason we went into the maze in the first place. My only regret with the Ripley’s Marvelous Mirror Maze, is that I let my husband lead us through it. You see, he has a really crazy accurate sense of direction. For example, he drove from a small town in West Virginia that he’d never been in before renting his car there that morning, to our house in Arkansas, in less than 12 hours, taking a different route than the one he took to get to WV – no wrong turns, no GPS, and no map. Yeah. I’ve also seen him drive a Jeep into the woods on one side of a park he’s never been to, drive through the woods to the other side, and then take us straight back to the campsite where we started as if he lived there. Needless to say, a mirror maze is not exactly a challenge for him. He pretty much led us straight from the entrance to the exit. Party pooper, that’s what he is. However, had I been leading, we probably would have been lost in there for for a while. The dead ends and rotating mirrors definitely had me confused. And if I’m going to be totally honest, the rotating mirrors freaked me out a little because well, have you ever taken five kids 6 and under in a mirror maze? Haha! I felt like I was herding cats through there. And two of them were being carried! It was entertaining for sure! I’m betting the other families we ran into inside the maze got a good laugh out of watching us! This is a smaller mirror maze, and to me that made it more suitable for my smaller kids. It’s certainly not a big attraction (the “marvelous” in the title may be a bit of a stretch 🙂 ), but it was a good place to take a break and have a few minutes of good, clean, family fun before supper. Though I don’t feel it’s worth the single ticket prices (Adults: $9.99 at the door or $8.99 online, Kids: $7.99), it could be worth including it in one of Ripley’s multi-attraction combo passes. Last month our family was blessed with a much-needed break from the real world as we traveled to Gatlinburg, TN for a week of family time and relaxation. It was wonderful. We truly didn’t want to leave. 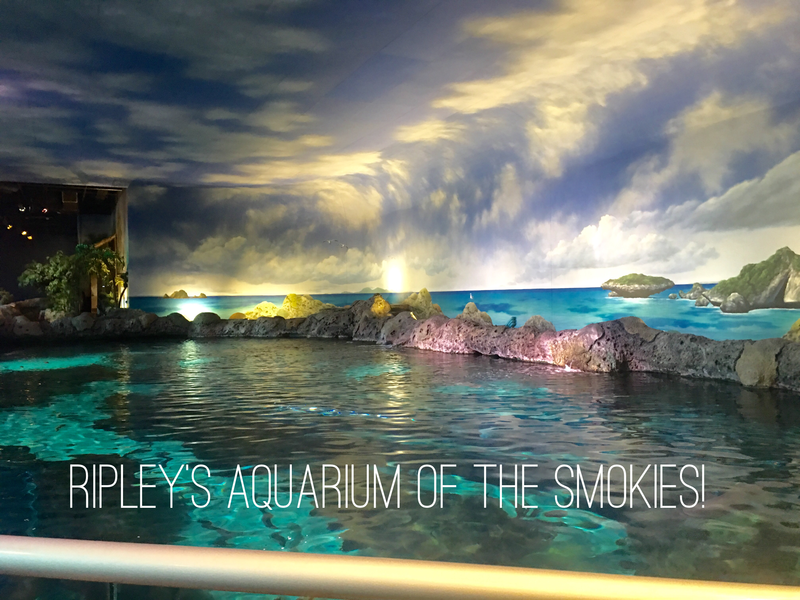 While we were in Gatlinburg, we got the chance to visit Ripley’s Aquarium of the Smokies, which happens to be right in the midst of Downtown Gatlinburg. We received complimentary admission in exchange of this review. However, all thoughts and opinions are mine. Sidenote: Having never visited Gatlinburg before, I was surprised at how many shops and businesses were packed into one street. I’m not sure what I was expecting – maybe a bit more spread out across town like Branson, MO? Anyway, it was really cool to see a large Aquarium sticking up in the middle of all that! We were a bit worried about parking at first. There is ample parking spaces, but there’s no way our big van would fit in the parking garage. There’s a large parking lot just down the street though, so it wasn’t a big deal at all. Anywho, back to our trip to the Ripley’s Aquarium of the Smokies! Lots of oceanlife, hands on learning areas, 2 play areas, a snackbar/restaurant, a Pearl Harbor exhibit, and more! Yes, you can see all that in one building, in Gatlinburg, TN. Yes, sharks and penguins in the mountains! The main level exhibits start just a few feet from the front door, and they did not disappoint! Beautiful, exotic fish and amphibians, a waterfall, many types of jellyfish, seahorses, crabs, and other sea life. I really enjoyed moving from display to display as my boys told me things they already knew about many of the species and my oldest read some of the information provided about others we weren’t familiar with. There are so many fun and interesting things to see an do at Ripley’s Aquarium of the Smokies, you will have to check it out for yourself. I’m certain with 5 kids in tow I missed some things. However, one exhibit I found to be very unique was the aquarium filtration and monitoring systems are visible to guests and explained through fun, interactive displays! The most impressive feature of Ripley’s Aquarium for our family is the Shark Lagoon exhibit. With a moving sidewalk, you can ride through the 340 feet long tunnel as sharks, giant stingrays, sawfish, tarpon, and other sea life swim around and above you. (Our crew had to go through multiple times.) We happened to reach this area just in time for the sharks’ lunchtime! That was awesome. My boys are still talking about it. Ripley’s Aquarium of the Smokies has two playground structures for the kids to climb and slide to their hearts’ content while parents can sit on benches nearby and rest their feet, feed babies, etc. Much to this mama-of-five’s joy, the two structures, which are beside one another, have entrances on separate levels of the building and are NOT connected. So don’t worry – your little one can’t enter on the ground level and escape on the second level. 😀 My kids had a great time playing though. Throughout the aquarium, I was very impressed by the hands-on and interactivity elements of so many exhibits. From touching crabs, rays, and jellyfish, to being under and inside tanks and exhibits, my children loved every minute of the experience and learned a lot. The newest exhibit at Ripley’s Aquarium is the Pearl Harbor Exhibit, a one of a kind exhibit, combining both history and aquatic life! Again, more interactivity! I was pleasantly surprised at how much my boys really enjoyed the Pearl Harbor exhibit – playing, reading, learning, observing, and asking questions! The Pearl Harbor exhibit is brand new this year, and just like Ripley’s Aquarium’s other exhibits, this one has something for everyone. Visitors of all ages were enjoying it the day we were there. Overall, Ripley’s Aquarium of the Smokies was one of the highlights of our vacation. I’m really glad we chose to visit at the beginning of the week, when our little kids were more well-rested and could enjoy the experience as much as the big kids. Definitely plan to spend at least 2-3 hours on your visit and have exhausted kiddos when you leave! We had a blast splash! Ripley’s Aquarium of the Smokies is open 365 days a year, but hours of operation vary by season. That info can be found HERE. Nearly every Sunday, I line my little ones up for a quick picture before we go into church. It’s just a fun thing I do because I like looking back at the photos as they change over time. I often share them on Facebook or Instagram, and it never fails, every few weeks someone comments or messages me asking, “HOW do you do it? !” The “it” being get 5 kids dressed up and to church weekly. Well, I just do. The same way some moms get 1, 2, or 6 kids up, dressed, and out the door to school every day. It’s important, so we do it, even if it’s not easy. Over the years, there have been many, many Sundays when I have carried a baby on my hip and/or held the hands of little ones as we crossed a parking lot, found classrooms, and made our way to seats at church. Unfortunately, a larger number than I care to count of those trips were done alone, without my husband beside me, especially over the last couple of years. Neither of us have enjoyed this situation, but it is what it is. My husband doesn’t like missing church, and I don’t like going alone. He’s also super helpful when it comes to getting kids ready and out the door. However, his job complicates things, and he can’t always go to church with us. Currently, he’s only able to go every other week. The other weeks, I’m on my own. He’ll help me get them out the door if he’s still at home, but I can’t get up counting on his help because if he gets a call and has to go, I’m left scrambling and unprepared. Been there. Done that. When I show up with our crew, I usually get surprised looks and comments like, “Wow! Supermom!” I usually smile and laugh, but if little ears weren’t listening I’d tell those onlookers, “No. Exhausted mom.” Because by that point, I am. I don’t say this to brag. At all. I say all that to tell you, it’s not easy. Most of the time I wouldn’t call it hard necessarily (unless you’ve been up all night with a baby and you’re running on 3 hours of broken sleep. Then it’s hard. Very hard. ), but it is work – a lot of work. It does require planning, energy, and dedication. I don’t have it all together. When we leave our house on Sunday mornings, more often than not it looks like someone broke in and ransacked the place. Not to mention, the pictures should speak for themselves. They certainly are not frame worthy every week. But it’s worth it. Very worth it. Even on the Sundays when things have gone terribly, terribly wrong, there has always been that one part in the sermon, or one comment from a friend or stranger, or that moment of Peace during a favorite song that reminded me why I did it that morning and encouraged me to keep going. I’ve learned that God gives strength to the weak and rest to the weary. I’ve learned that people you have no idea exist (because you’re busy counting heads and rushing to the potty) are watching you and the example you set, good or bad. The few weeks I have stayed home and deemed it to be too much work, I have always regretted my decision. Mamas, take your babies to church, even when it means going without your husband. I believe those may be even more important Sundays because the effort you put in shows your children that even when it’s not easy, and it is exhausting, it’s worth it. It’s important to go and worship with other believers. It’s important to join with a church family and learn and serve together. Church isn’t just something we do when it’s convenient or easy. It’s part of life, and life is messy. 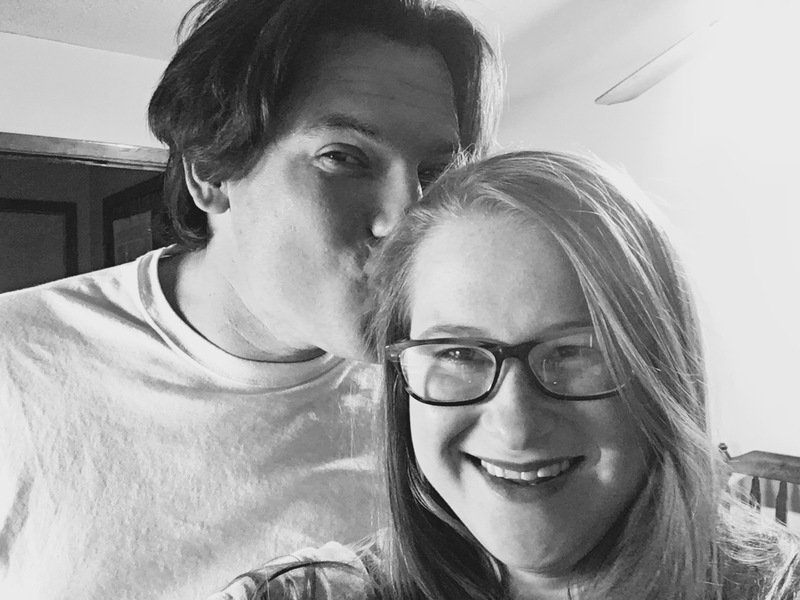 We’re going into our third year of homeschooling at our house! Wow. That’s so crazy to think about. I read once that most people give up on homeschooling in the first three years, so that has been my goal – 3 years. Do it three years, and if then it isn’t a fit for our family, we can try something different. Well here we are, entering year 3, and I’m not thinking about quitting anytime soon. 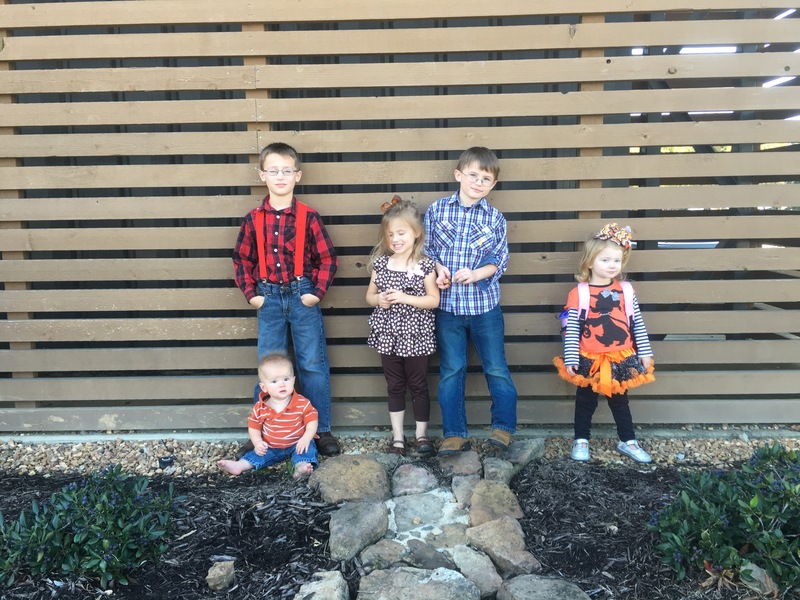 There are several reasons our family homeschools, but I’d like to share just a few of them with you today. Hopefully I can provide a little encouragement to someone that is on the fence about it or is having a rough day. If you’re 6 weeks in (or 6 days or 6 years), and wondering, “What on earth have I gotten myself into?” take heart. Breathe deep, and remember that His mercies are new each morning. Is it all roses and fingerpainting? Nope. Some days there are tears all around. Some days are exhausting and overflowing with to dos, as there just aren’t enough hours in each day. Some days my husband comes home and I go hide in my room to cry because I’m certain I’ve failed terribly and I need to repent to God and my children. Some days ARE all roses and finger painting – on the front porch, with school books and cups of lemonade scattered around. In winter, some days are books read aloud, all of us curled in a pile in front of our fireplace with little ones on top of me and bigger ones next to me, sketch pads and Lego blocks strewn about. They also get to explore their own interests. Today we’ve had lessons in sewing, and my crew is currently working to plant their own winter garden. Family time. My husband’s job is demanding. It’s not uncommon for him to walk in the door, just to turn around and leave again 3 minutes later, or 30 minutes later just as I’m setting plates of food on the table, only for him to return long after the kids are in bed. When he’s off work, we soak it up. When he has a Friday off, we have a family day. There’s no rush to get everyone up and out the door. We can run errands as a family or just hang out at the house. 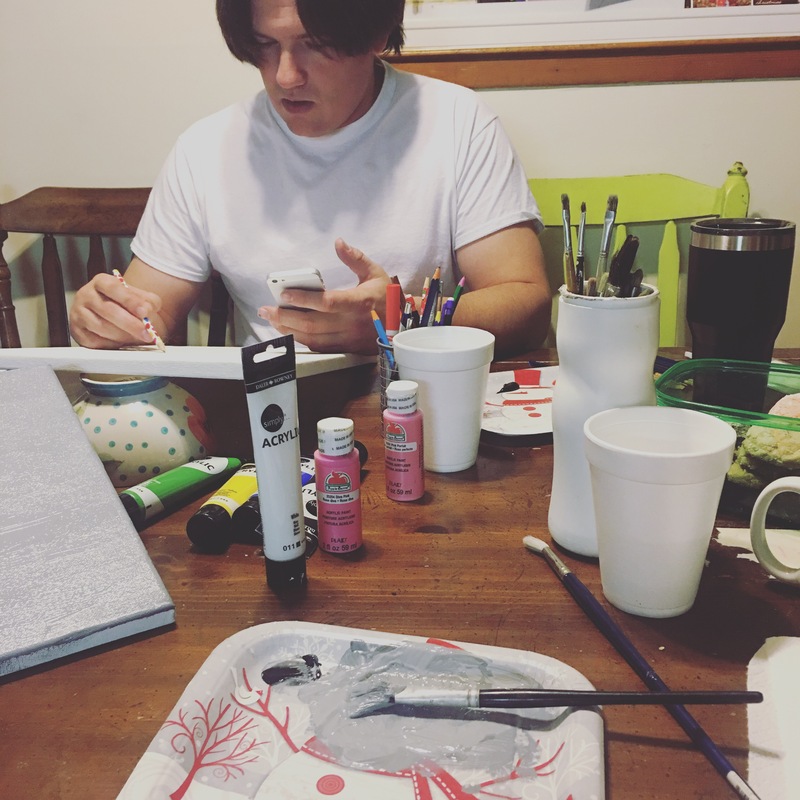 When my husband works on Saturdays, we take that time to work ahead in preparation for the days he is off. Relationships. Watching my 6 year old son teach his 3 year old sister how to fold laundry. Or all four big kids having piggy back races through the house. Just this morning Ihad a conversation with my older boys about my number one job being to teach them to love God and love others. If they can recite the entire Declaration of Independence or multiply 5 digit numbers in their heads, it means nothing if they don’t love God or each other. Because I was called. My number one reason. This is what keeps me going on those hard days. Even when I start to daydream about handing the teaching over to the local school district, I know in my heart I would be disobeying God. That is not His Will for our family. Does that mean we will homeschool forever? I have no idea. God’s plan for our family may look different in several years, or it may look much the same. But for now, this is my calling, my family’s calling, and we are thankful for the opportunity to make it happen and the blessings it brings with it.